HMD Global has been busy since taking over the Nokia smartphone brand and there’s no sign that it’s slowing down, as at least two more phones are seemingly on the way and we now know a bit more about both of them. The flagship Nokia 9 has been rumored a number of times now, but a back cover from the device has seemingly just been photographed by a user of Chinese website Baidu, revealing a glossy back with a dual-lens camera and a fingerprint scanner sat below it. We say revealing, but we have seen these exact features before on renders, this is the first time any part of the Nokia 9 has actually been caught on camera though. It could of course be fake, but it matches up with what we’ve seen before. Previously we’d also heard that the Nokia 9 will have a 5.5-inch QHD screen, a Snapdragon 835 chipset and at least 4GB of RAM, so, as the name suggests, it’s likely to be positioned at the top-end of the range, above the Nokia 8. Right at the other end of the range we’ve got the Nokia 2, which less is known about, but which was apparently briefly listed on retailer B&H’s website. The listing has since been removed, but not before it was spotted by Winfuture.de. The Nokia 2 was supposedly listed in black and white shades, both of which cost $99 (around £75, AU$125), so if accurate it’s set to be very cheap. Previous rumors suggest it will have a 4.5-inch screen, a Snapdragon 212 chipset, 1GB of RAM and, surprisingly, a 4,000mAh battery. That last spec could be its main selling point. 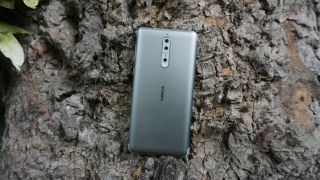 There’s no release date known yet, but as it was briefly listed by a retailer it could be coming very soon, as could the Nokia 9, given how much we’ve heard about it.